GREENSBORO, N.C. — Today Carruthers & Roth, P.A. announced that attorney Britton Lewis has joined the firm’s commercial real estate practice where he will focus on real estate development, leasing, secured financing, commercial lending and commercial bankruptcy. “We are delighted to add Britton to our team and know that his experience will benefit our clients,” said Chris Vaughn, director and shareholder at Carruthers & Roth. Before joining Carruthers & Roth, Britton completed a two-year clerkship with the Honorable Patrick Flatley in the bankruptcy court for the Northern District of West Virginia. In that role, he gained significant experience in bankruptcy and real estate law and in secured transactions. Britton is a graduate of the University of North Carolina School of Law. While a student there, he was a research assistant on bankruptcy matters for a law professor. 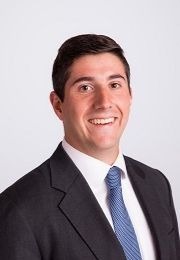 He completed an externship at IQVIA (formerly, Quintiles Transnational) where he assisted in the drafting of securities documents, commercial contracts, and corporate policies, and an internship with the Insurance Section of the North Carolina Attorney General’s Office involving insurance, corporate and construction law. He also completed an internship with the District Attorney’s office in Chatham County. Britton can be reached at bcl@crlaw.com or at 336.478.1137.